"We are looking for people over 60, who live with arthritis or other long-term health conditions, who feel isolated or lonely and would like the opportunity to learn how to self-manage. We have a team of trained volunteers who understand what it is like to live with a long-term condition and chronic pain. They are ready to provide people with personalised support to help them take control over their condition. Participants receive a personalised action plan, based on their own circumstances, and what they would like to achieve. Then volunteers visit them at home every week for up to eight weeks, to help follow the action plan, and identify a community activity they would like to attend." Maron sent us a poster which is a bit difficult for us to display given the size limitations of the page so we've reproduced the text from the poster below. You can see the poster here however. 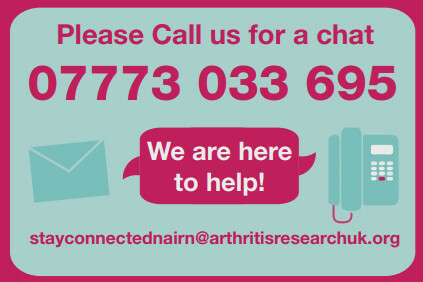 June is one of a team of Volunteer Connectors delivering a new type of support to older people with arthritis/other long-term conditions in Nairn and the surrounding area. June lives with Ehlers Danlos Syndrome (EDS) and, therefore, understands the difficulties involved in living with chronic pain and physical limitations. June was recently matched with Jack, who had been discharged from hospital after a prolonged stay with severe and multiple medical problems. When he returned home, he was using a wheelchair to get around indoors and a scooter for outdoors. Jack was determined to get back on his feet as soon as possible and he was already managing well under the circumstances. But he was feeling quite low about his limitations: the inability to get out in his car, his motorhome, etc. meant he had to find new hobbies. He rarely had visitors and he didn’t like to ask for help either. We used the Older Persons Outcomes Star to identify what Jack wanted to achieve and what stage he was at currently. We looked at what mattered most to Jack, and where he might need some support. From this, we were able to break down Jack’s personal goals into manageable steps and develop an Action Plan that June would support him to follow, making use of self-management techniques to help him take control over his condition. June visited Jack every Tuesday for eight weeks and they followed the plan together, which enabled Jack to set himself goals in between visits. Each time Jack achieved his weekly goals, he grew in confidence and felt better equipped to make even more progress. As his self-esteem grew, Jack was also doing exercises he had been given by the physiotherapy team, to strengthen his muscles, and using a walker provided by the OT to get about the house. But to get back behind the wheel of his car, he needed a lighter wheelchair. “That’s okay”, says Jack, “I know where I can buy a lightweight wheelchair!”. It wasn’t always plain sailing, there were some setbacks, which Jack used the problem-solving technique to resolve. And there were low points when Jack was very anxious about a close family member who was very ill. June provided a valuable listening ear, and reassurance for Jack when he reached a low ebb. With such high expectations of himself, he was prone to getting frustrated at what he perceived as slow progress, but June kept him focused on what was achievable, reminding him how far he had already come in a relatively short period of time. Jack has made excellent progress so far, but more importantly he has picked up some new skills, which he took to very quickly, and will stand him in very good stead in the future. Whoever said you can’t teach an old dog new tricks was clearly wrong! What a fantastic service they are offering. Well done to Nairn again, for taking on the needs of anyone and everyone who requires help. I do know that occasionally, there are issues with people who are housebound, or who cannot be discharged from hospital, due to lack of available carers. There are many, recently retired people in the community who I am certain, would love to help, but need a helpful bit of guidance to get started. For example, getting PVG clearance (Police checks to you and me) and ensuring that insurance, if needed, is in place to help people on a voluntary basis. Good luck to Nairn. Wish I lived a lot nearer than I do or I would be volunteering to help the Staying Connected in Later Life team.